Swedish authorities seem to be indifferent to the desperate situation of Iranian refugees who have escaped severe Human Rights violations in Iran. Deporting them would put them at a great risk of being arrested, imprisoned, and tortured or in some cases even executed. Mrs. Shahrzad Sakiani, an Iranian Christian convert, is one of the asylum seekers at risk of being deported to Iran. Mohabat News – Shahrzad Sakiani was a Christian asylum seeker in Sweden. Stockholm immigration police arrested her last June and eventually deported her to Oslo, Norway with an accompanying officer. 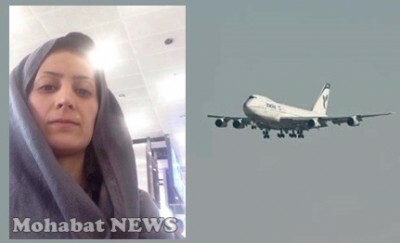 In just 24 hours, despite all efforts by Human Rights activists, Norwegian immigration police forced her to board a Qatar airways flight to Tehran via Doha. Two female officers and one Iranian-Norwegian officer were commissioned to hand her over to Iranian authorities. The officers forced Shahrzad to get on the plane in Oslo airport, despite her resistance. Norwegian officers took her to the plane so aggressively that her shirt was torn and by the time she was on the plane, her upper body was naked, she had a headache and her nose was bleeding. This violent interaction had caused her to lose control of her bladder and make nervous screams. The two female officers held her arms and put their hand over her mouth. The Iranian-Norwegian male officer, who had introduced himself as Farhad, kept kicking her knee and forced her to take a seat at the tail section of the plane. Farhad held her tightly on her seat and pushed her head between her knees so she wouldn’t scream. Shahrzad told Mohabat News that she was so scared that she could hardly control my screams. After a few hours in transit at Doha, she was put aboard a flight to Tehran. The Qatar Airways flight landed in Tehran early in the morning. The officers used a blanket as Hijab to cover Shahrzad and took her with them to one of the halls at Imam Khomeini airport. There, Norwegian officers tried handing Shahrzad over to Iranian authorities along with her deportation letter. Iranian police refused to receive her as Shahrzad did not confirm her identity. The Iranian-Norwegian officer, Farhad, did all he could to convince Iranians to accept Shahrzad. He even threatened Shahrzad that if she didn’t cooperate, he would inform Iranian authorities about everything she had told them in confidence in her refugee interview concerning the Islamic regime of Iran. Shahrzad told Mohabat News, “The disrespectful treatment by the Norwegian officer, Farhad, had allowed Iranian authorities to disrespect me as well. When one of the bearded Iranian guards saw the cross around my neck, he snatched it from me and threw it away. This was done so violently that the mark it left on my neck remained for a couple of days”. Ultimately Iranian authorities refused to accept her in Tehran without identification. She was returned to Oslo with the officers. The Iranian-Norwegian officer told Shahrzad that he would do everything to collect the required documents from the Iranian embassy in Oslo and return her to Tehran. Shahrzad was shocked by Farhad’s threats and escaped the detention room that night. She is currently living in an undisclosed location and spoke to Mohabat News from there. She asks Human Rights organizations to condemn this inhumane treatment by Norwegian Immigration police. She also pleads with all her Christian brothers and sisters in Iran and around the world to support her and her husband in prayer. Shahrzad Sakiani and her husband, Mahmoud Mohammadi, have had their asylum application rejected in Norway twice. When they tried to apply in Sweden, they refused to grant them asylum seeker status and deported them to Norway. Our friends at Mohabat News are a group of Bible believing Christians who believe in propagating the word of God. They have made the spreading of the good news of God’s love and forgiveness among Iranians and the Farsi speaking peoples of Afghanistan and Tajikistan their primary goal. The Lord has placed on their hearts to bring awareness of what is happening in the world to Farsi-speaking readers. Helping Christian and non-Christian Iranians raise their awareness of what goes in our world and in their own country. Mohabat News acts as a cultural and social bridge between the world community and the peoples of Iran, Afghanistan, and Tajikistan and to better inform the worldwide Church of Jesus Christ and Christian ministries around the world about the life and the welfare of Christian minorities in these Farsi-speaking countries. OSLO, Norway, Nov. 4 (UPI) — A newscaster on Norwegian state television said she was told she can no longer wear a small gold cross on the air because of complaints from viewers. “What I don’t like is that people out there can just call in and tell my boss what I should and I shouldn’t wear,” Siv Kristin Saellmann told The Local. Saellmann began wearing the cross last month on a program broadcast by NRK’s regional news for southern Norway, The Local.no reported. Viewers immediately began to call in and complain to regional editor Anders Sarheim, demanding that Saellmann not be allowed to wear the cross. Saellmann said her husband recently bought the cross. Saellmann said she will comply with the policy. “I wouldn’t like it if people that watched me read the news on TV considered me as being apart in some way. I want to be as neutral as possible,” she said. R.It reports, some viewers — especially members of the local Islamic community-protested claiming that catenin “with the cross offends Islam,” and “this symbol does not guarantee the impartiality of the channel”. 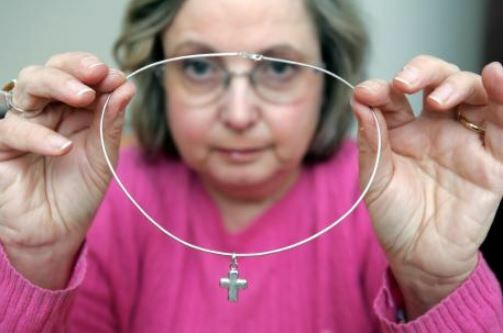 Recalling the case of Nadia Eweida, a British Airways check-in attendant who was sent home from work for wearing a crucifix. The case has been widely reported in the UK media because various groups have argued that it shows either anti-Christian prejudice in the UK,or alternatively, favoritism towards people of faith. In the case of Coptic Christian Eweida, the judgment of Strasbourg had highlighted “the importance of freedom of religion, an essential element of the identity of believers and Foundation, among others, democratic pluralist societies”. At the same time, however, the Court had warned by cases in which “the religious practice of an individual trespasses on the rights of others”. In those cases, it may be “restricted”. Who knows the necklace of Kristin in which case falls. VOP: When Nadia Eweida took her case to the European Court of Human Rights (ECHR), the court said BA had not struck a fair balance between Ms. Eweida’s religious beliefs and the company’s wish to “project a certain corporate image”. The ECHR ruled she suffered discrimination at work over her Christian beliefs. A professional journalist should be able to report on any subject no matter their religious belief, or how much they may personally disagree with a point of view. Reporting, or discussing a subject is not agreeing with it, but enlightening others to bring knowledge and a level of understanding about the topic. Being that she is a well known, respected journalist in the nation, her choice of jewelry should not be irrelevant. As a Christian interested in upholding religious freedom and expression, it is disappointing that she would be concerned that others might consider her as ‘being apart’ in some way. In my opinion it would have been better for her to explain that her religious belief, or a cross around her neck would not affect her ability to report the news. No one should be forced to hide their Christianity to please others. The use of any material or its part from this website and quoting in mass media requires appropriate credit and a link to the Voice of the Persecuted page where the information was taken. The articles and replies from commenters published on this site do not necessarily reflect the views of the Editors, or that of Voice of the Persecuted, or of other contributing authors on this site. Voice of the Persecuted also reserves the right not to publish replies to articles should they so choose. This site contains copyrighted material the use of which has not always been specifically authorized by the copyright owner. We are making such material available in our efforts to advance understanding of persecution, religious freedom, freedom of worship, human rights and social justice issues, etc. We believe this constitutes a 'fair use' of any such copyrighted material as provided for in section 107 of the US Copyright Law. In accordance with Title 17 U.S.C. Section 107, the material on this site is distributed without profit to those who have expressed a prior interest in receiving the included information for research and educational purposes. For more information go to: http://www.law.cornell.edu/uscode/17/107.shtml. If you wish to use copyrighted material from this site for purposes of your own that go beyond 'fair use', you must obtain permission from the copyright owner. The views and opinions expressed in the media, articles or comments on this site are those of the speakers or authors and do not necessarily reflect or represent the views and opinions held by the Editors, Voice of the Persecuted, or of other contributing authors on this site. The editorial staff oversee and administer the site pursuant to our editorial criteria. However, due to the social nature of this site, Voice of the Persecuted cannot be held accountable for the content in the web community. Voice of the Persecuted strives to bring you truthful, accurate news reports and information. However, we do not warrant the accuracy, timeliness or completeness of the information obtained by outside links, authors, or comments added by our audience. If you have a complaint about something you have found on this web site, please contact us. VOP is endorsed by the State of Michigan. 501(c) 3 status for Voice of the Persecuted Inc. has not yet been received. You will be notified of exemption approval.